My son’s favorite game in the whole world is Let’s Play With The Other Baby! You Know, The One We Keep In The Mirror. We bring him over to this giant mirror in the hallway and he goes berserk, he paws at the “other” baby, kicks his legs, squeals and laughs. It cracks us up too. Babies: they’re so cute when they’re kinda confused! It took us a few weeks to realize how sad this game actually is. My little monkey is so outgoing and eager to make friends that he’ll play with an imaginary baby that lives in the mirror to get his fix. Perhaps, we realized, hanging our heads in the shame of being the worst parents, ever, it is time for him to meet some other babies his age that he can paw and squeal at in person and they can hopefully paw and squeal back. But, of course, this isn’t a story about Jacob’s first playdate, it’s about what I made for breakfast. Or more accurately, what I didn’t make: baked eggs and busy stratas and quiche and baked French toast and winter fruit salads and anything involving jam on bread or plates and forks. Because remember the part about the two infants? You’d be amazed at how ineffective four whole sets of adult hands are at keeping two teeny tiny infants out of harm’s way. Thus when I spun the wheel of the Things I Want To Cook list and breakfast pizza came up, I knew it would be perfect for eating with one hand while fishing out a piece of Oh God, What Is That In Your Mouth? with the other. I was a little dubious about the intersection of mozzarella and eggs — I had a very awful omelet with that combo, plus basil, a few years ago — and I was also convinced that the eggs would roll right off the crust but ended up finding this pizza absolutely, utterly perfect in every way. The recipe is from The Big Sur Bakery in a treesy nature-loving part of the country I can barely wrap my head around right now, having spent almost the entirety of this last year in this concrete jungle and its suburban counterparts. I digress. The pizza is cheesy without being excessively so and somehow, that baked bacon/egg/melted pile doesn’t even feel heavy with all of those fresh herbs and mild onions on top. Plus, the pizza has this kind of grab-and-go, low-key vibe that is perfect for weather that demands you don’t idle long inside. Hooray for that! When I asked what I would change about this when I make it again, I drew a blank. I actually like it that much the way it is. Nevertheless, the bacon could of course be omitted if you’re bacon-averse, countless toppings could be added from spinach to mushrooms or sausage, you could swap some or all of the mozzarella for goat cheese and you could swap out some of the flour in the crust for whole wheat flour. Although the recipe as is makes two large pizzas, I think it would be fun to make six smaller ones with one egg each in the center — plus, friends could choose their own toppings. So “drew a blank” = okay, I have a few ideas. But I’m pretty sure I’ll be making this exactly as written next time. 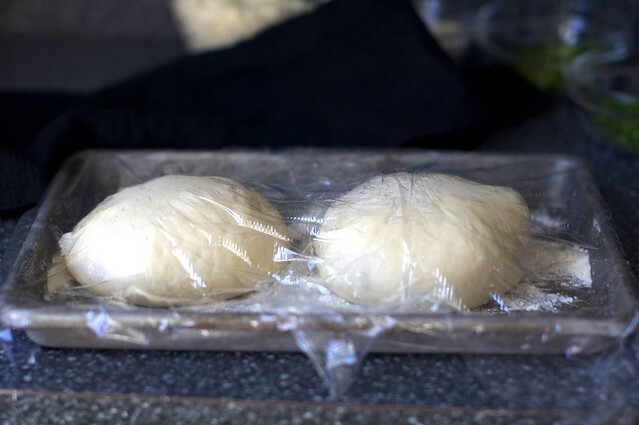 Updated note 10/17/13: I love this dough recipe, but these days I almost exclusively use this Lazy Pizza Dough (no kneading/proofing/chilling + you can choose the schedule that fits your day). The night before, prepare the dough: Place 3/4 cup lukewarm water in the bowl of an electric mixer fitted with a dough hook. Sprinkle in the yeast, stir and let sit for 5 minutes. Add the flour and 1 teaspoon of salt and mix on low for 1 minute. Increase the speed to medium and mix for 2 minutes, then increase the speed to high and mix until a smooth dough forms, about 2 minutes more. Turn the dough onto a lightly floured surface, divide into two equal pieces and form each half into a tight ball. Place on a large floured sheet pan, place the pan in a plastic garbage bag, tie the bag loosely and refrigerate overnight. One to two hours* before baking, place the dough in a warm spot. Adjust the oven rack to the lowest position and set a pizza stone on it. Preheat the oven to 500 degrees 30 minutes before you are ready to bake the pizza. Prepare the dough and toppings: Fry the bacon in a large sauté pan over medium-high heat until crisp. Cool on a paper-towel-lined plate; roughly chop. Dip your hands and a ball of dough into the flour. On a lightly floured countertop, pat the dough into a disc with your fingertips, then drape the dough over your fists and carefully stretch it from beneath to form a 12-inch circle. Generously dust the surface of a pizza peel or large inverted sheet pan with flour and place the stretched dough on it. Sprinkle the dough with half of the Parmesan, mozzarella and bacon. Crack 3 eggs over the top and season with salt and pepper. Bake the pizza: Shake the pizza peel slightly to make sure the dough is not sticking. Carefully lift any sections that are sticking and sprinkle a bit more flour underneath, then slide the pizza directly onto the baking stone in one quick forward-and-back motion. Bake for 8 to 10 minutes, rotating after 5 minutes. When the crust is golden, the cheese is melted and the egg yolks are cooked, use the peel to transfer the pizza to a cutting board. Sprinkle half of the parsley, chives, scallions and shallot on top. Let cool for 2 minutes, slice and serve immediately. Prepare the second pizza in the same way. * The original recipe suggests that you take the dough out one hour before baking but I took mine out two hours earlier, because I always find it takes a looong time to get dough back to proofing at room temperature. In this time, you can lazily prepare the toppings and get your oven nice and hot. LOVIN’ the eggs on there over easy. never thought of it that way! Simply delicious! This looks like such a fun pizza!! Delicious. I LOVE eggs on pizza–why don’t I ever try this at home? Maybe with some prosciutto? Thanks for the inspiration, Deb. This looks incredible! And those are some of the most beautiful eggs I’ve ever seen – look at the color of those yolks! Fabulous. You can bet I’ll be making breakfast pizza very soon. Breakfast pizza!? Brilliant! I can’t do the “dessert” pizzas which usually end up being a piece of dough that’s coated in canned apple pie filling and doused in chocolate syrup, but this breakfast pizza definitely looks like something I could have a play-date with. Or an eat-date. Whatever. I’ll definitely have to try this, thanks for the recipe! This looks fabulous! I just might have to try it this weekend. Thank you!! I saw that pic and immediately knew it was from the Big Sur Bakery. (I own that cookbook too but have been too intimidated to try anything from it yet). But if you can make it with two curious infants around, maybe I can do so with one lazy cat. I love making breakfast pizzas! Eggs on pizza is just the best idea ever. I’ve made one with kale in the sauce and eggs whole (like this one), and a REALLY decadent one on a snowy weekend that had sausage gravy as the “sauce”, crumbled bacon, cheese, and scrambled eggs. No wonder breakfast is my favorite meal of the day. Jennifer — I’d expect the dough to be good in the fridge for a full day. Looks delicious! Pizza was actually next on my to make list! Quick question – how long can i store the other pizza dough in the fridge? Beautiful! And funny, I’m completely obsessed with eggs right now, add this to the list. As always, beautiful pics. Yum… this sounds like the ideal breakfast to me. My boyfriend and I had our first date in Big Sur, and we ate at the Big Sur Bakery every day… it’s so awesome! WOW that is some glorious looking pizza – PIZZA FOR BREAKFAST AND IT’S NOT A COLD WIMPY SLICE OUT OF THE FRIDGE! I have seen eggs on pizza but somehow that never made me think of eating pizza for breakfast (other than cold leftover pizza, of course). Brilliant! I looooove you! i love the egg on pizza – so i can dip the pizza crust in! Oh.my.goodness…this looks incredible! Certainly great for entertaining. I drove through Cali last summer and stopped in Big Sur, and it is absolutely beautiful. It would be great to go back and get a taste of this there, but making it at home will suffice. I live with a “cheese-hater”, so unfortunately I’d have to omit the mozz. (I have to admit, I usually leave the parm without telling him…what he doesn’t know won’t hurt him). Thanks for posting this…I can’t wait to make it! The cafeteria at Brigham and Women’s Hospital in Boston uses scrambled eggs to make an awesome cheesy eggy breakfast pizza…so I always associated it with a cafeteria style reused leftovers type of dish. This? Much more sophisticated! This looks amazing! And also like my dinner tonight. What a delicious looking breakfast pizza! We do the same thing with our puppy when we haven’t been to the dog park in a while. It’s his mirror-puppy friend and he just loves to give him puppy kisses and thoroughly slime up our hall mirror. I’m definitely putting this recipe on my list, but I think I might sub in a little whole wheat flour in the pizza dough (just because I sub a little whole wheat flour into just about anything I can). Long-time listener, first-time caller…er, reader/writer. Your recipes are so reliable, and I always feel like I’ve gotten them from a kitchen-competent family member (none of mine are). Anyway, you’re great, obviously. I notice this isn’t your go-to pizza dough recipe, to which I have become very loyal (along with many of your other recipes :)). Any reason why that one wouldn’t work (i.e., I don’t usually have bread flour on hand, though perhaps I should). Eventually puppies and babies figure out it’s just their reflection. Thanks for posting this recipe! My husband and I had the most delicious breakfast pizza at El Dorado Kitchen in Sonoma. I’ve been craving it ever since! Deb – dough hook question for you. I have my Bubbie’s 30+ year old KitchenAid mixer, and her attachments. The dough hook seems really small. I’ve used it before, but it keeps missing all the flour/dough/etc from the bottom of the bowl and doesn’t seem to “knead” anything well. Have dough hooks improved and gotten bigger over the last 30 years? Is this user error? I’ve had terrible results with this recipe in the past — the eqqs coming out extremely over-done by the time the crust is ready. I’ve adapted by making the rest of the pizza as written but frying the eggs separately and merging them after. Why did I never think of this before? I’ve put all those things together on toast but never in a pizza format, I have been missing out. I wouldnt’ have tried it if I’d just seen a recipe but the photos sell me on it. What a cool idea! I love pizza, any pizza, but I do believe this is the best pizza recipe I’ve seen. Off to the grocery! Mmmm! Breakfast in pizza, burrito, or other medium is such a weakness of mine. Now I’m hungry. YUM! Eggs and pizza…I love this! Pizza for breakfast? You’re a genuius Deb! I’m sure all that cheese put you right back to sleep! Oh how I’d love this for Sunday morning!! I’m pretty sure this combines all of my favorite things–pizza, breakfast, and bacon (yes, bacon doesn’t count in the breakfast category! It gets it’s own!) If only I could figure out a way to get maple syrup on there! Oh YUM! Pizza and breakfast — these are some of my favorite things. I am so glad you happened upon this recipe so I could find it here. :) Most breakfast pizzas I’ve seen are loaded with sausage and scrambled eggs, and it eventually becomes an artery-clogger on a plate. Glad to see a more refreshing take on this recipe! This will be on my breakfast menu very soon. Totally brilliant. Good thing I believe in Second Breakfast, since I’ve already eaten one this morning! I JUST thought about this pizza and low and behold, you made it. Now I must make it! Looks wonderful! Oh I love the idea of individual breakfast pizzas! That’s fantastic. Actually, playing with their mirror-selves is really good for small children – It helps them understand their movement, and helps their imaginative play, so don’t be super quick to remove it. Maybe just add in some other kiddies sometimes. The breakfast pizza is something I will be trying when the husband gets back. I checked out the Big Sur Cookbook from my library just moments before your post went up. I’ll be making this on Saturday and visiting the bakery this summer! I will definitely have to try this. I need more easy breakfast ideas. Some people might think making dough from scratch makes it not easy, but after that point it’s pretty basic assembly from the looks of things. My only problem is that, at the moment, our oven is the only place warm enough for dough to rise. Maybe I can try on top of the fridge since it’s emptier these days. Also, in regards to the baby in the mirror thing, I remember reading a theory in a college sociology class that babies don’t realize they are separate entities (or more than arms or legs, etc) from the world around them until they see themselves in a mirror whole and complete. I’m not saying your feelings/ideas aren’t valid or anything, but it’s also pretty cool that you could be the beginning of Him as he knows it. This is ingenious. Making it this weekend! This looks incredible. I’ve been on an egg kick lately, I must try this! Thanks for sharing this recipe. We love breakfast pizza. I also let my son play with his imaginary friend in the mirror, keeps him occupy for a while. Can I substitute bread flour for all purpose? Which brand of bread flour do you use, do you get it from Whole Foods? Deb- What about those of us without dough hooks or kitchen aid mixers (I want I want I want, but it’s one of those items that I think “I’ll get one when I get married…”)? How do you recommend making this dough by hand and wooden spoon, sans mixer and dough hook? meredith — This, or any dough, can easily be mixed by hand. Just as you said, bowl and wooden spoon. Kneaded out on a counter. Valerie — Yes, all-purpose flour can be used. Bread flour gives a better chewy bread consistency, but either will work. I used King Arthur Flour. I bought it elsewhere, but know you can get it at Whole Foods. Alissia — When a recipe says “warm spot” I always take it to mean whatever spot in your home is warmer and less drafty. If there’s no actual warm spot, any place will do. This sounds like the perfect meal any time of day, not just breakfast! I might try some fresh arugula instead of bacon. Babies and mirrors are hilarious! It’s probably because they’re so used to seeing giant adults everywhere that when something comes down to their size they can hardly contain their delight! I love breakfast foods, and your pizza for breakfast looks delicious! I’m sure your son will be really happy when he does get his first playdate! In the meanwhile, I’m sure it’s nice that he can amuse himself! This looks amazing! I’m making this as soon as possible. Thanks for the delicious recipe! This looks fantastic! I’m making it this weekend. You’re right, I can think of a lot of ways to change this up. The options are endless. Thanks. I typically veer towards the sweeter side of breakfast, but this pizza would be a phenomenal addition to our breakfast-for-dinner meal rotation! UGH! this pizza is the bane of my vegan existence. this looks so good . . . This is one of my favorite recipes from the book! I have found the pizza dough to be even better if allowed to age two days prior to baking! Uh oh! Time to have another baby! :) So making this pizza tomorrow morning. Or…. right now. He’ll still love the baby in the mirror, even when he’s had tons of friends over to play. This looks so yummy! And I could definitely see having this for dinner too! thanks for another fantastic recipe! Never though of pizza for breakfast but I can’t easily imagine having this one! What a delicious idea. Deb ~ I swear to God in Heaven you read my mind – like Johnny Carson channeling ‘Carnac The Magnificent!’! I’ve wanted to make a breakfast pizza for a couple of years now – Jamie Oliver did one in a brick oven and since we have a Big Green Egg could totally make one but for whatever reason, haven’t. Mushrooms, spinach, goat cheese – am making this right now! You slay me – so appealing that pizza is! Have you tried the panne fratau pizza at Otto – it has an egg and a shaving of pecorino. enjoy, it doesn’t last long enough! So usually “breakfast pizza” usually just means breakfast foods in the shape of a pizza. But this is really breakfast PIZZA!!! I LOVE it!! The sunny side up eggs right on top?! Awesome. Thanks for sharing this one!! I’d probably still make this for dinner it looks so darn good! My favorite thing to do with left over pizza is top it with a poached egg for breakfast in the morning. We had a clam pie once, a simple white pizza with olive oil, garlic, provolone, chopped clams, fresh oregano and a bit of lemon juice. It was perfectly delicious the first night, even better the next day when the warm egg yolk ran all over it. How cool is that? I might end up scrambling the eggs a bit if I try this at home. Not a fan of runny eggs. This is perfect! I love pizza anytime, but actually making it for breakfast! Brilliant! Although with a little one the same age as yours in the house, how do you find the time! Usually breakfast for me is some yogurt and granola or cereal. BOooooring. Maybe this will be a good weekend breakfast idea, so the hubs can watch the baby while I prepare this tasty treat! Holy Yum! I have never seen a breakfast pizza done with the eggs yolks soft like this. What I great idea. And i like Giovani’s idea of making breakfast pizza out of left over pizza by putting an egg on top. This looks SO GOOD. I saw the photos on flickr and I actually had a dream about this pizza last night and had to check for the recipe today. Can’t wait to try it!! Oh I’m so hungry and want that! Beautiful. 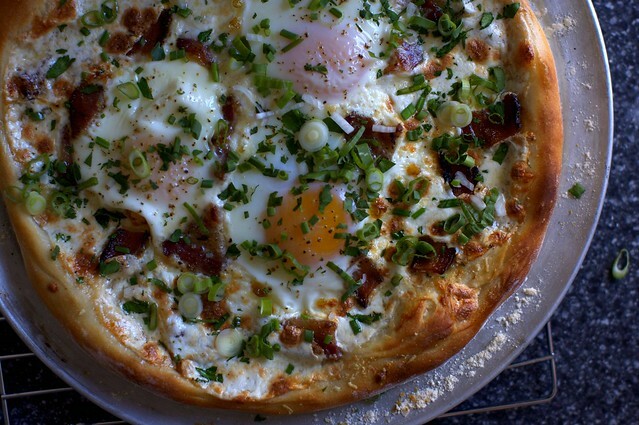 I have never seen a breakfast pizza that looks so… sophisticated. I love it. Beautiful! Looks delicious! Love the idea of the mini pizzas, great for a brunch! How interesting. I would never think to bake eggs on a pizza like that! wow. that look ah-mazingly devine! I will be making that for my B&B guests!! YUM! I love Big Sur Bakery – quite possibly located in one of the most beautifully places in the world. I love everything I’ve ever made from the cookbook, the brown butter bars and upside down apple cake especially. Never tried the breakfast pizza, but as soon as I saw your picture I was reminded that I should. I’ve often cracked a raw egg over ham pizza just as it comes out of the oven and find it so decadently delicious so I know this breakfast pizza must be good. I’ve long been in search of a breakfast pizza that was yummy AND wasn’t way too heavy or rich. This looks PERFECT! Now, who can I have over for breakfast this weekend? How unique! How novel. I love this idea! OMG that looks like something we could eat over here at French Skinny! Oh, heaven. That looks good! I have made breakfast pizza with scrambled eggs on top, but I have no idea why I didn’t think to just throw the egg right on there and throw it in the oven! This will definitely be a weekend adventure in my kitchen. Thanks! When I read the title, I cringed a little. When I saw the picture, I knew I’d try this. I think I’d like to try it with spinach and turkey sausage. Can you think of a way to incorporate scrambled eggs? I guess I could make them a little runny on the stove and add them in on the last few minutes of baking to firm up? Let me know what you think. By the way, Jacob is still one of the cutest babies ever! Glad to see age hasn’t affected his good looks. this is pretty much my go-to dinner! i use a flat pita for the sake of speed, sprinkle on some minced or sliced garlic and whatever cheese i have at hand, then chop some spinach and make a little nest out of it for the egg. crack the egg, sprinkle on a little salt & pepper, and bake it (in my toaster oven, no less) at 400 for 15 minutes. perfect. i never, ever get tired of it. variations abound: spinach & ricotta & olives (though i often leave the egg off this one), mozz & basil & any-sort-of-onion…i could go on and on. i think the nytimes did a series on savoury breakfasts a while ago. if breakfast pizza didn’t come up then, it should have! looks delicious! This looks amazing! I love eggs when they’re baked on anything so this is right up my alley. What a brilliant idea :D I ‘ve to try it! My computer is being goofball so I can’t search the comments to see if this is mentioned but do we think this would be awful with storebought pizza dough? I am afraid of yeast. If you serve him pizza for breakfast, what do you serve him for lunch? Dinner? How many times per week do you feed him pizza? Just asking… because this pizza does look really good! Yum!! This has just gone on my “to make” list, right at the top :). ALISSIA — This time of year our kitchen stays pretty chilly, so when I have a dough of some sort that needs a warmer place than the kitchen counter, I heat the oven up to 450, turn it back off and open the oven door and leave it open til the oven’s cooled back down — the heat warms the kitchen up nicely and since the heat rises, the top of the fridge is where I set the dough until I need it. Works like a charm! I swear sometimes we share a brain! I was looking at some pizza dough (extra from pizza night and yet-to-be frozen) and fresh eggs in my fridge yesterday morning and thinking, wow I really want to make a breakfast pizza! I’m going to try this tomorrow morning. Thanks!! Oh, serious YUM going on here. I can just picture my farm, fresh eggs proudly crowning the top of this pizza – my egg basket runneth over! Individual pizzas – perfect! Great looking pizza! This is odd. I have read 3 blogs today that use baked eggs. Mmmm, I love those gorgeous eggs on top of that pizza! I’ll have to try this! Puppies are totally sweet when confused, too :) Something about that puzzled head-tilt! Ooh cracked eggs right on top, I love it! Small individual ones are indeed a good idea. When I worked as a baker, we made them with foccacia dough with 1 egg in the middle contained by a circle slice of red pepper. Breakfast Foccacia! I love this recipe and so does the rest of my family. I first made it when I saw a pic of it on tastespotting. Sometimes we will make it with ham cut into little shreds. Mmmm delicious! I love the idea. I love pizza !! This looks great. I’m sure it would be good. Yum ! Oh the pizza looks fantastic, too! Wow – I can’t wait to make this! Quick question: Does anyone know how I can substitute some whole wheat flour for the all-purpose? Amounts, ratio, etc. I’d still like it to look and taste like pizza dough. Any tips are appreciated! Kristen — I like to start ww flour swaps with just a 1/3 amount. It’s my preference to make sure it doesn’t get too hearty/brittle before trying it in the next round with a 1/2 or 2/3 swap. I love breakfast pizza. I was a little weary about cracking an egg on a pizza at first, but when I tried it I fell in love with it. My 9 year old daughter loves this too. I actually clipped this recipe out of the NYT magazine last year—or the year before, I can’t recall—and it somehow fell by the wayside. Now that you’ve “uncovered” it for me, I think it’s time to roll up my sleeves and make breakfast pizza. My nephew loved that game. He also became gleeful (is that a word) when he would catch a glimpse of the baby in the mirror. He would look at himself in the mirror for hours, talking to that other baby. It was by far his favorite game and really mine to watch him interact. So funny!! Oh my word! Look at that pizza! The crust is perfectly browned, the eggs are perfectly set. Um, I kind of hate you. In a good way. Eggs on pizza sounded simultaneously totally wrong and totally right to me the first time I had it: Crispy pizza with Arugula, Mozzarella, Runny egg and parmigiano shavings on top. Oh my god it was like the best thing I ever put in my mouth. This pizza looks equally delicious. ps: Not that i’m comparing Jacob to my sister’s cat, but he does the same thing in the mirror. I wish we could get him some kitty playdates or something, but cats are kinda solitary and b*tchy, aren’t they? That’s it. I just love it. This looks absolutely amazing! I just read an article in the NY Times about Austin’s famous breakfast tacos and have been craving a real American breakfast ever since. This will surely be on my breakfast table as soon as I get back to the states! I had a pizza frequently while i lived in Italy with a fried egg on it that was incredible! I’m so excited to try this. That sounds unbelievably good. I’ve seen eggs on pizza before, but I’ve been a bit dubious myself. I think I need to get this cookbook. Baby in the mirror, very Freudian. That pizza looks wonderful! BTW, the breakfast pizza looks amazing! I would pay mega cash to eat that at a resturaunt; maybe I’ll make it myself (with eggs well done, of course!). “*” = Insert ways a baby who is but a blob of mere life can kill themselves in the time it takes to brush your teeth of your choice, here. #43 and #120: you’re thinking of Lacan’s mirror stage. All that imaginary-baby playtime is merely building his concept of ego, so it’s not all bad, right? As for the pizza… I might make it for the boyfriend, but I can’t stomach eggs unless they’re disguised by lots and lots of other ingredients and flavors. What an awesome idea! I will have to give this a try at home for sure :) Thanks for sharing! So I’m assuming you’re not a kosher jew? Oh yum! My mom lives in Big Sur and we LOVE The Bakery. I will have to try this. My favorite quick substitute for pizza dough is Naan (Indian flatbread). Most grocery stores have it in the deli section and the sizes are perfect for personal pizzas. In my opinion those pre-made crusts are just icky and when you cook them they are either get too soggy or way too crispy. I am also partial to throwing them on a grill versus baking them in the oven, there is just something about the charred flavor I just adore! Anyhow I am already invisioning myself on the couch Sunday morning cracking the yolk and having it spill all over my little pizza. And the possibilities are endless…sausage, perhaps something with potatoes even?? Excuse me, I now have to wipe the drool off my keyboard…thanks for yet another amazing recipe! Eggs on pizza are one of my favorite toppings. Plus, I feel it justifies eating leftovers for breakfast! Looks delicious. Are whole wheat flour and bread flour the same thing? If I don’t have any bread flour can I do half white flour and half whole wheat? This recipe looks so good and I really want to make it! Jenny — Whole wheat and bread flour have nothing to do with each other. Bread flour has more gluten in it, for extra stretchy/chew; whole wheat is from the wheat’s whole grain. I’d suggest using 2/3 white and 1/3 whole wheat. Sam — I’m not sure why anyone would assume I’m Kosher, seeing that pork, shellfish and the intersection of dairy and meat are all over this site. Deb, how would you describe the texture of this dough once cooked? I’m still searching for the perfect recipe…chewy & crispy. I’ve not yet used the dough hook on my new KitchenAid, but this might be a good way to break it in. So everything about this looks delicious to me and why anyone would omit the bacon is beyond me as well. That’s great that your son can stay entertained that way. My three year old just got a full size mirror in her room not too long back–she’s transfixed, becoming different characters and taking herself to various lands. So you have this to look forward to. I can just see it as he offers something you’ve made to his new friend. I used to make pizza like this at a health food store that I worked at. I was always experimenting with different pizza ingredients and anyway I wanted to tell you about a beet pizza I came up with. I use marinara, mozzarella, shredded beets, red bells, artichoke hearts and FETA. It looks just beautiful, I always did it with rings of overlapping color, like the shredded beets on the outside with the red bells and then the artichoke hearts in the middle. You should give it a try and post it! GOODNESS! That looks INCREDIBLE!! I want to make it tomorrow for breakfast!!! My daughter loved looking in the mirror. Still does. As soon as she could talk, she told us how beautiful she is and how she loves to look at herself. I remember a womanfriend saying that my daughter had no self-esteem problems whatsoever. I’d like to think your son is similarly enjoying himself! Perfect timing! I’m going to make this tomorrow night with the leftover chicken sausage, peppers and onoins that I have sitting in my fridge. Thanks for the inspiration! I love how excited kids get around mirrors :D It makes me so happy! I just love this idea. It actually looks filling and light all at the same time. this pizza looks excellent! love your site. i’ve bookmarked so many recipes and tried quite a few (just starting to cook) first time commenter, hoping to stay within the guidelines just to tell you that our babies must be about the same age because the “other baby” warrants the same response (: i love it. yum!!! I’m definitely making this this weekend, but probably with your standard pizza dough as it has become my go-to dough. Your regular pizza dough would work, right? I just picked up King Arthur flour on sale at my regular grocery store (King Soopers for those in the West). Man this pizza looks fantastic! I’ll definitely have to try it out since I’m incapable of resisting anything with bacon. Looove making pizza! I’ve been improving my crusts by making the dough earlier in advance- which leads to tastier, sturdier crust! I would love to try this with cheddar cheese. What an awesome recipe with all those herbs, mmmmmm…. Yum. This looks delish. I love the idea of pizza for breakfast. My boys would love this. Making it this weekend. Thanks! What a fabulous idea! I never thought about making pizza for breakfast. This looks delicious – thanks for sharing! Wow! I’ve never seen that before. Congratulation for originality! I had pizza dough in the fridge so I made this for dinner. I knew it was going to be good, but I had no idea it would be THAT good. Thanks. You’re my hero! One of the local bakeries (massachusetts) makes this superb cinnamon bread that is gooey and sweet. I finally got around to making cupcake sized bread puddings with a bit of bourbon. Made the entire evening feel better! Oh wow. Absolutely, positively delicious-looking. We have company in town now who don’t find the eggs on top to be appealing, but my husband and I are now anxious for them to leave so we can try it out! Thank you so much for sharing such a delicious recipe! 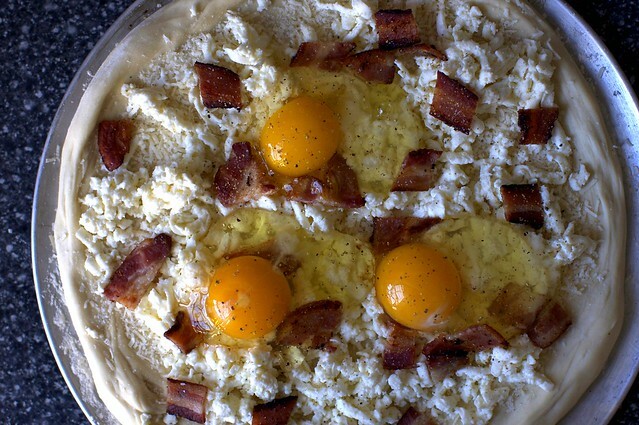 The idea of a breakfast pizza sounds lovely (and the pictures look amazing!!). I also like Lisa’s suggestion of trying it out with prosciutto. I’m going to try it this weekend– thank you! I LOVE this recipe. My friends made it for brunch, but topped it with fresh cilantro and it was amazing. So much so, that I kept talking about it for weeks and had friends over to make it, except we had so much snow in DC that my breakfast turned into dinner, in which I made the delicious brisket you posted a few weeks ago. But, I do agree, there are lots of directions this pizza could go, but it is also perfectly delicious as is…. The pizza looks wonderful…great for a brunch. The baby, however looks incredible..he is the cutest boy and getting so big…soon he will be right there in the kitchen beside, Mom…what a happy day that will be! Loved the photo, clicked on the picture from the foodgawker’s website. I just told my husband 2 days ago that I wanted to make a breakfast. I will be making this one on Saturday morning for breakfast. Thanks so much for the recipe. I think I might hold back the eggs, put the pizza in and give it 2-3 minute head Then, slide the rack out and crack on the eggs so I could get a sludgy, runny yolk. AND THEN put a big pile of lemon and olive oil dressed arugula on top right when it comes out of the oven and eat it with a knife and fork! Oh yes. I can see this Sunday’s breakfast already. #27, Beth: 30 year old KitchenAid dough hooks are exactly the same as new ones (I have both!). If the hook is leaving dry parts at the bottom of the bowl, just keep mixing. Unless the dough is way overfloured, it will eventually come together. And it’s almost impossible to overknead dough, so a few minutes extra is not a problem. Yu can also stop the mixer and use a scraper to incorporate the crumbs, then knead some more. This is a great alternative for a casual brunch! Thanks for sharing the recipe. Just a note on using plastic garbage bags with food. I have been told not to use them in food preparation because they are often sprayed with insecticide. Wonderful! You know what – this idea of placing an egg on the pizza just minutes before it gets ready came to me from another source. And what we do, we place as many eggs as there are people waiting to jump in, less one or two at the centre of the pizza (normally not exceeding 3/4 )- and we piece the pizza as we go by, so cut out a piece, finish it, cut another, and if you are lucky and fast enough you get the egg! Funny? A big treat for those unruly kids who love to have the soft yolk rolling on their tongues. :) A great recipe. I think this is one of the best looking pizzas I’ve ever seen. Oh you’re making my stomach rumble! It’s not fair. I want a slice! Re: warm spot. Someone (maybe you! I can’t remember) recommended putting the light on in the oven and letting the dough double in there, with door closed. Not sure if this might be too warm. Am going to try it though. I wanna make this!!! It looks yummy! This looks great, but really, what time would one have to get up in order to make this for breakfast? Something simpler, please? This is the perfect idea! Pizza for breakfast without feeling guilty. Nice. This looks wonderful! I’m definetly going to have to try it soon! Well, NOW that’s exactly what I want for breakfast, and I’m stranded on the UES, far from my kitchen. Sigh. Breakfast pizza isn’t so far-fetched..eggs benedict, egg-in-a-hole, poached egg on toast and even Egg McMuffins, have been around forever, so this is just another variation of eggs on some kind of bread. In fact, it makes more sense..one pan cooking for the whole thing, almost. Can’t wait to spring this on the family this weekend. I bet Jacob would share this with his mirror mate. Probably not a good idea! Oh, one more thing. TURKEY SIZE OVEN BAGS..are perfect for rising formed dough. Everything fits in them with room enough to tuck under the ends. And you can see your dough and they can be reused. How handy is that! I thought of this years ago. I started the breakfast pizza business. A lawsuit is in order. I’ll see you in court Smitten Kitchen! OOh, yum. I have a cheater GF method – I bought these pizza crusts from French Meadow Bakery that are still raw, frozen dough, and gluten-free. Definitely gonna thaw one while I make toppings, and just top them with this yummy breakfast fare! I’m not big on eggs, so I apologize my comment is not about the recipe. But, my baby (10 weeks old) and I play the mirror game too. There’s a song that goes with it. “Who’s that baby in the mirror, who’s that mommy in the mirror?” ….over and over and over again. I can’t think of other lyrics to change it up a bit – but he likes it just fine the way it is. And we sway back and forth so his feet kick the “other feet” and mommy says “whooooaaa, whooooaaa” as we get closer and farther away. Amazing how motherhood makes otherwise intelligent adults act so silly, huh? ALSO. I saw these mini pies in mini mason jars on wedding bee (i think they came from a blog called our best bites) and I thought of you becuase they were so adorable and miniature that I almost died. It seemed like something I would see on here! Do you think you could freeze these after they are baked? When our daughter (who is now 5) was 2-3 yrs. old she was so extroverted that at one point she had 39 imaginary friends that she played with even when she was playing with real kids. She also loved the mirror thing when she was a baby! Love the pizza idea – we’re going to have to try it one of these days! Babies are sort of like dogs chasing their own tails–so extremely funny to watch and love! I know you are enjoying motherhood more than you ever thought possible. It feels like your heart is literally going to explode there is so much love there. BTW the dish looks wonderful too! @159, SusanPrincess. Thank you! I kept googling different pics of dough hooks and couldn’t really tell if they were new and improved or not. I will keep it going next time and see if the dough works itself out. Wow, you have a lot of followers! I understand why, I love your blog!! And just what I’ve been wanting to track down, a pizza with egg on top. We always order these when we’re in Paris, they’re so wonderful! Now I can attempt it at home. I was actually digging through your site last weekend trying to find a recipe for this for a pizza dinner party! I guess I’ll just have to host another one. Thank you! Okay, I am so sincere when I say this – this looks like the best breakfast ever. Pizza? Check. Running (but cooked) egg yolks? Check. I could go on and on. Just wanted to put the word out to other fans and friends to head over there and vote for you! I don’t know how I haven’t thought of the notion “breakfast pizza.” We had a dinner pizza with an egg on it and that just made me ill. But somehow this pizza looks amazing. As for the mirror trick, I think its hilarious and if it makes your baby smile, let him gaze at himself (though he doesn’t know it) enthusiastically. My fiance and I have a dog (/our first child) and try to get him to recognize himself in the mirror. And now I sound nuts. Your photos are incredible. I would love to have such good photos on my site. I’ve made breakfast pizza in the past. It’s such a fun idea. We should compare recipes. I always told my mom we should have pizza for breakfast…now I have proof that I was right! Yeah yeah, egg pizza…oh my goodness your son is adorable! I followed your link to his picture and browsed through the photos. He is just soooo cute! I made this today and I was suprised at how delicious it was!! (Actually it’s not that big of a suprise because every recipe I’ve tried from your blog always comes out tasty-when done right). All I did was omit the bacon and instead of parmesian I used gorgonzola. I feel I am repeating myself over and over again everytime I think of commenting .. Great site .. great recipes !!!!!! THANK YOU!!!!! I am making this tomorrow morning for hubby! ( I will cheat and buy crust) Thanks for great recipe for this weekend! Lovely recipe, Deb. Do the yolks come out hard-boiled, or softer than that? codfish — Up to you. You can cook them until runny or firm. I went in-between, they were just gelled without being firm. This looks so good! Thanks for the reference to Big Sur. Hope you get to go there some day, but then, maybe you won’t want to go back to the concrete jungle. Amazing! I go to Vesta in Astoria every weekend for their “Hangover Pizza” which is the same thing you just made. I was looking for an at home solution! While I do love bacon, it can get quite crunchy at times and I don’t like that interrupting the soft, gooey texture of the cheese and the creaminess of the eggs. I think if I made this, I would use an imported ham. What about using another cheese for this? Maybe fontina or gruyère? Or maybe a blend. I personally adore havarti, but I’ve found it has an almost watery quality to it when melted, so that might not work well here unless it’s only part of the cheese medley. I’m distraught that you started off with this intriguing story of Jacob’s first play date & then just ended it abrubtly, with no details of how it actually turned out! Why did I start counting calories this week!? I just want that whole delicious pizza right now! Pizza AND Bacon. OMG, that looks amazing! Did you grate the mozzarella on a box grater? It looks so perfect. When I try that, the cheese crumbles and smooshes. 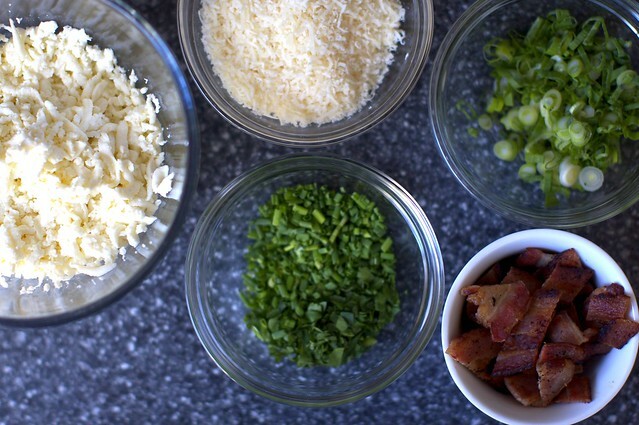 Do you have a tip for fluffy grated mozzarella?Thanks again for another crave-able recipe! Eggs go with everything! Christina — It was fresh mozzarella, the stuff often in water, so it is actually a bit softer. But yes, I used a box grater. This looks absolutely delish! I will have to try this hopefully this weekend. Thx! I think my kids would be sold on this one right away because it’s pizza! I think it looks fantastic! My sister and I have a theory that if you put an egg on it, it makes it a breakfast food. I love the idea of this Pizza! I sooooo cannot wait to make this! So creative. I absolutely love eggs over easy and can’t wait to take a bite of that pizza with the egg’s gooiness running all over the place! YUM!! But here’s a stupid question: If you’re going to put BACON on it, why oh why does the recipe call for KOSHER salt?? Is it just about grain size? I’m lost. This might just be brilliant. And with dough readied the night before, the best easy breakfast ever. Hmmm….. I dreamed last night that you had us making hard thin pretzels (like you buy in a bag at the store) from scratch, and I was crazy enough to think that it was a great idea, so I am SOOO happy to see such a wonderful looking recipe this morning! Thanks! I think this recipe just “spoke” to me. Wow, looks amazing. I have to try this. hmm I have one of your best pizza doughs ever sitting in the fridge (we only ate one last night though I had prepped two) …now if only my sleeping guest would rise from the dead I could get eating! Yum! Made this for breakfast this morning, and it is totally delicious. I just used the extra half of a pizza dough (I use the Joy of Cooking pizza dough recipe) after making pizza for dinner last night and just one pizza is perfect for two people. Laura @178: I baked the pizza for 12 minutes at 475, and the eggs came out perfect – yolk was soft but not runny (think just past a perfect over-medium egg). THIS. LOOKS. INCREDIBLE. I always enjoy checking out what you come up with!! Very inspiring. I used to work at an Italian restaurant. The food was great, but the only thing that sucked was there were never any ingredients for pizza! So the cooks started making amazing breakfast pies. They beat the eggs and then poured them over the pie in place of pizza sauce. If you are not a fan of baked eggs, this is a great alternative! Now this is GENIUS, I’m gonna bake this and I don’t even like pizza! What a great idea! I can’t wait to try your recipe. What a great idea and it looks absolutely amazing! I wanted to let you know I mentioned you and your blog along with this particular post (recipe) on my weekly Cups of Tea. Your mention will be included this Sunday, March 14th. If you have time, I’d love for you to stop by. Thanks again for a great addition to my recipes. I have heard from two different people about this breakfast pizza and when I opened up my reader I found that it was on your site! No surprise. I can’t wait to try it, really a wonderful idea. I’m sure it will be a hit. Mmm, looks delicious. I will definitely have to make this, subbing out the bacon for fake bacon. I made the mushroom caps you posted before doing the same thing, and adding a bit of additional olive oil to make up for the lack of bacon grease, and they were wonderful! I have to confess, I’ve never had a breakfast pizza before. My husband would eat pizza every day if he could and loves a pizza at Otto in NYC that is made with pecorino cheese and has a fried egg on top. This will make a great breakfast treat for him! I want to eat this now!! that looks like the best breakfast ever. Love the sunny eggs perched on top – love love love it. Must make this. I’m thinking a few bits of potato would be heavenly added on this as, and perhaps some sundried tomatoes. One INCREDIBLY FABULOUS option for a topping change is substituting guanciale for the bacon. At home we knock off a pizza made at my brother’s restaurant in Seattle, Serious Pie, that has an olive oil and parmesean base and is topped with an egg, guancialale and red pepper flakes, then with fresh arugula dressed with olive oil, lemon juice, sea salt, and parmesean shavings. YUM!!!!! I think this would be yummy on your version as well. Sorry for the Serious Pie plug, but as it and my brother were on Food TV – it is as close as I get, so I completely abuse it as my claim to fame!!!!! Just made this for breakfast and it was fabulous. Thanks for another great recipe. I made this pizza this morning and it was delicious! My boyfriend doesn’t like his eggs sunny side up, so I beat the eggs and poured that over the top of his pizza. The eggs cooked fully and puffed up in the oven – both of our pizzas were delicious. Thanks! #169 Laurie – So make it simpler yourself! Make the dough the night before for an overnight rise and prep all the ingredients. Go to bed, then wake up 30-60 minutes early to pull it all from the fridge and allow it to warm to room temp. (Do something else while you wait: dishes, coffee, bills, TV, books.) Assemble and bake. Voila – awesome breakfast that YOU outsmarted! Yum. Just made this pizza with pre-made Boboli dough from the grocery store. It was a cinch and so delish. This will become a go-to brunch food for us. Thanks for great recipe. Enjoyed this post and your musings on motherhood — thanks! Breakfast pizza looks like an idea I could get behind, although I might not have initially thought so — but so many I things I love, all together in one portable place. Yum. I made this for Sunday brunch today and it was amazingly good. I will probably make the crust a little thinner next time (I made it too thick and it was a little doughy). I did sauté the shallots and liked how that turned out. I will definitly make this again! Thanks, Deb! Wow breakfast pizza!! mmm this looks so good! Oh this is heavenly! I’ve finally gotten myself Gluten Free pizza dough mix and think I will try this next weekend! I’m in awe of how perfect the eggs look on top of that pizza. I made this for my 8 year old son and his friend this past weekend and it was an absolute hit. It was quick and easy to make and the kids loved the idea of eating pizza for breakfast (just wait until they are teenagers). It might be fun to play around with additional ingredients (maybe sneak in some spinach or try it with a whole wheat crust) but really, who am I kidding, it is perfect as is! I never though you could eat pizza for breakfast but it sound absolutely fabulous! Breakfast and pizza – clearly, two words that need to be together more often. Breakfast pizza sounds like a mighty fine way to spend a lazy sunday morning reading the papers, eating something that could be breakfast, lunch and dinner all in one go! mmm that looks soo delicious! I’ve never had fresh pizza for breakfast but i think that’s about to change! This was great! I cut the recipe down and made an individual pizza for dinner this weekend and had it with a tomato and thyme salad. The egg was a little too hard for my tastes but my oven tends to run hot. Next time I think I’ll try adding the egg a few mins into cooking. Eggs on pizza = brilliant. I use to work at gourmet pizza place and our egg pizza was the most popular. For those complaining about overly hard eggs by the time the dough is cooked through, I recommend this: Crack each in egg into its own small ramekin and cook the pizza until the edges of the dough have firmed, and maybe taken on just a little color. Once it hits that point, slide the eggs on top of the pizza and cook the rest of the way. You’ll get perfectly done crust with soft yolked eggs on top. I strongly encourage using your broiler for the last few minutes to get nicely browned toppings and good sizzle on the eggs. I made this for breakfast for Saturday and it was really delicious! Husband loved the pizza surprise. Thanks for sharing! Ok, so I made this for dinner last night and my eggs came out very rubbery. They tasted good, but the consistency was strange. Is this the intended effect, or did I do something wrong? Emilyelizabeth — Hard to say. My eggs were not rubbery… maybe yours got a little too cooked? Brilliant idea! egg pizza! I’m thinking of using quail eggs so I have a better egg ratio per slice. I’m thinking, I may have to add it mid baking so I dont over bake eggs. Eggs and goat cheese is my new favorite combo and I’d love to try this with that substitution. Also – the individual pizzas sound perfect for when I just want one for myself! Looks great, but one should be enough. What do you suggest on freezing the pizza dough for later? Should be before or after it goes in the fridge for a night? This pizza looks incredibly delicious! I’d love to try it. And as always, your photography stuns me. yum!! i’ve never thought about making breakfast pizza before but this one looks delish! I love trying out new pizzas! This is such a wonderful and new idea. I really want to make this for breakfast this weekend. Thanks for the great recipes! This is genius, we’re always looking for new breakfast ideas, especially for the weekend. With a newborn in the house we’re trying to get used to a whole new way of life so the inspiration in the kitchen is necessary now a little more than ever. Awww! Sweet Jacob, i am visualizing him in front of a mirror! BTW Have i told you that i mostly come here (after his birth) for Jacob’s stories and photos, and your recipes and lovely photos are just secondary? I am sorry but he’s too cute to ignore! After my recent trip to Europe, eggs on pizza’s seem like a norm to me. I was quite grossed out at first, but I LOVE them now! i grew up with an electric oven with the heating element at the top, and now i’m using a gas oven, with the heat obviously at the bottom. when i see recipes (like this one) that call for a certain rack position, I never know if that’s closer to the heat source or farther? can you set me straight? i want to make this as soon as possible! Great recipe! A friend and I made it for a houseful of musicians this weekend with mushrooms and leftover roasted asparagus on top. Definitely an addition to the recipe file. Wonderful. We made it tonight, and it’s hearty enough to be a perfect “breakfast for dinner” recipe. And since we sometimes say to hell with cholesterol, we fried potatoes in the bacon grease while the pizza baked. We made no changes to the ingredients, but I did it on a hole-y metal pizza pan instead of a baking stone, so we decreased the temperature to 450. Thank you!!!! This reminds me of a very classy spin on the traditional breakfast casseroles that have hashbrowns on the bottom and eggs over easy on the top. wow the first picture is incredible! Love your blog!! I take this as a sign that you need another baby. As in, another Deb + Alex baby. That would be so fun! This looks AMAZING! And very original. I saw a very similar pizza on “The Best Thing I Ever Ate” on Food Network and drooled over it. Thanks for the recipe! My kid also plays with an imaginary other baby. Her friend lives in the oven. She’ll crawl into the kitchen, pull herself up on the broiler drawer, and sing songs to The Baby In The Oven. It’s very cute, and very creepy. holy crap! my favorite food in the world can make my least favorite meal of the day more appealing! and i agree, a new version of the eggs with bread and cheese is appreciated. great post! I was running out of mozzarella so I mixed what mozzarella I DID have with some pepperjack, and also scattered slices of fresh jalapeno under the cheese. It was awesome! Thanks for the inspiration. I went the individual pizza route and it was so good! Made 6 small ones with an egg in the middle. Delicious!! This recipe is divine. I took the individual pizza route with one egg in the middle and added sauteed mushrooms as well. A tip for those who are raw shallot averse: sautee them briefly in olive oil and it takes away some of the bite. I will definitely make this again soon. After much anticipation, I finally got to make this for breakfast today. I can’t WAIT for leftovers tomorrow morning!!! Perfect food combo ever. This turned out great (followed toppings, used own pizza dough recipe). Thanks for the great idea. I made this for my husband last week. He’d been traveling for work for three weeks and his flight home was arriving just in time for Sunday brunch. I put together all of the ingredients before I picked him up from the airport and then assembled and baked when we got back. He was skeptical, but after his first bite he was convinced this was delicious! And it was. Thanks for a great homecoming meal! Thanks for the recipe! We made the individual pizzas this morning and loved them!! Only one small problem… we don’t have a pizza stone, so they were just cooking on a cookie sheet like we normally use for pizza, when the cookie sheet warped and bent and one egg went sliding to the floor of the oven!! Uh oh! We luckily were able to finish cooking the pizzas more or less before the egg burst into flames and I had to turn off the oven and dump baking soda on the flaming egg before it burned the house down or something. We’ll definitely make these again… but hopefully find some way to avoid the burning smell and terrible clean-up that awaits me back in the kitchen. My husband is obsessed with pizza and I am pretty much done with the idea of a normal pizza…thankfully this is different enough that I can make it and we can both happily try it. The soft yolk eggs look beautiful in the pictures! Just wanted to give you an update. I made the pizza as promised and blogged about it! I say put an egg on it and it will taste good. I love the idea of breakfast pizza. The pizza looks delish, but I have to comment on mirror play. The first time one of my daughters looked in the mirror, she was distraught. We couldn’t figure out what was wrong, until it dawned on us that the mirror felt nothing like her identical twin sister, and she thought something was wrong with Jessica (who was in the bath at the time). My eggs also were waaaay overcooked by the time the crust was done. Flavor were awesome though. I put the shallot, green onion, and parsley underneath the cheese since I prefer those items to be a little bit cooked rather than raw. Next time (and there will be a next time), I will beat the eggs, pour them over (or maybe into) my shallot/green onion/parsley mix, and then put the cheese and bacon on top. I hate rubbery eggs. I love how the eggs look in your photo, but I don’t think mine will come out right if I try it that way again! This was amazing!! I did use *gasp* a Premade pizza crust from our bakery (job + school + kids = compromised standards sometimes!) The eggs were done perfectly and all the flavors were perfectly balanced. I also used applewood smoked bacon, which added a bit of sweet to the savory. This is definitely going to be part of the breakfast/brunch repeat list in this house! Oh, and I put 5 eggs on the pizza so that each member of the family could have one egg on their slice–still worked great. Delicious!!! I made this for dinner last night. I just recently came across your site–i’d heard of it but never checked it out. Thank you for this delicious recipe. I used venison breakfast sausage instead of bacon because that’s what we had. And no shallots because we had none. So delicious! My husband and my 18 month old son were big fans also:) I let the dough rest for about 25 minutes in a warm spot (instead of overnight in the fridge) and it turned out just fine. This would be a fun recipe to play with..go vegetarian and add some spinach, etc or maybe try canadian bacon, etc, etc Yum! Made this for breakfast this morning – yum yum. I used part whole wheat in the crust (used the Bread Baker’s Apprentice recipe). I also added some sun dried tomatoes (from the garden this past summer), some diced potatoes fried in some of the bacon grease, along with cheddar cheese and romano cheese (didn’t have mozzarella) and the bacon & eggs. We topped it off with fresh chives from the garden rinsed in the rain we’re having this morning and healthy dose of freshly ground pepper. So good, thanks for the inspiration, I would have never thought of cracking eggs on top of a pizza, but they’re so perfectly sunny on a dreary cold rainy NE Ohio morning. We made the breakfast pizza this morning. It was delicious! Instead of bacon, we used some breakfast sausage and it turned out great. –We don’t have an electric mixer, so we hand mixed. The dough was much too dense and dry with the amount of water used (flour was left unmixed in), so we needed to add a little bit more to make it manageable by hand. –The next morning, the dough was too tough to stretch by hand, but using a rolling pin made this easy. –We made one pizza with broken yolks and one per the recipe. –Both ended up needing to stay in our oven about 5-7 minutes longer than suggested. Great recipe! Can’t wait to make again! Thanks Brad&Joe – I’ll have to use that advice when i give this a go without a blender. thanks! I’m visiting my family in Colorado and I made this breakfast pizza this morning during a snow storm. Luckily, I had bought all of the ingredients last night (including pre-made pizza dough from my grocery store’s bakery). The pizza was a huge hit. My parents are very picky eaters and they LOVED it. They had eaten nearly the entire thing before my brother had even gotten out of bed! My only issue was that one of the eggs was slightly undercooked and my pizza crust got HUGE bubbles. I love this recipe, it was the second that I’ve tried from your site and I’m in love! I still play the “other baby” game. Don’t think I would care for that pizza though. Eggs on pizza — genius. Deb, your blog is always my go-to for successful recipes! I made this last Saturday and I enjoyed every bite! I used store-bought dough and made two individual 8″ pizzas out of it. I omitted the green onions, substituted Romano cheese for the Parmesan, added mushrooms, and drizzled some olive oil on top. I also only used one egg per pizza but I might make it two next time. I was worried that the egg would end up being undercooked but it was perfectly medium. I bought dough from a pizzeria and made this and it was great! I made this for breakfast today with your ‘Really Simple Pizza Dough’ and it was a huge hit with my husband and two boys (both really picky eaters). I just want to say how much I love your recipes and stories. Your adorable son reminds me so much of my boys (8 and 5) when they were smaller – enjoy the cuteness. I’m making this tomorrow morning for my boyfriend’s 31st birthday – if it comes out anything like the awesome pix you took I’m sure he’ll be pleased! wish me luck! 2 c. + 2 T. bread flour weighs 9.5 oz for those who have a kitchen scale. I got two 8 oz portions of dough when I divided it in half. Can’t wait for breakfast tomorrow! I made tiny pizzas back when you posted this, and froze them to reheat later in the week for a quick (but delicious) workday morning. I made six; we ate four before forgetting that there were two more. When I remembered the other two yesterday, you know what we had in our fridge, Deb? QUAIL EGGS. OMG, cutest breakfast pizzas ever! Teeny tiny pizzas with teeny tiny eggs scattered over them! Also, *delicious. * I love your blog so much — thanks for everything! so yummy! we made it with pizza dough bought at trader joe’s, though, as we were short on time. regardless, it’s easily one of the best breakfast pizzas we’ve had. this will definitely be added to our list of favorites! thanks for sharing! I have been thinking of making something like this for awhile. i would change the size of the eggs used tho. The way you have it sliced, if you used quail eggs, each slice would have a whole egg on it. In Australian pizza places, you can buy an “Aussie pizza” which has an egg onit just like this, so basically you’ve discovered the Aussie, congrats. Oh, Deb, we borrowed the Big Sur Cookbook from the library this week, and we’re in love with the idea of visiting not only the restaurant, but also exploring every niche of the whole area. Wanted to tell you, too, that your asparagus hash was the inspiration for the red & yellow pepper-zucchini-green onion-garlic-leftover steak-roasted potato hash for breakfast today. I plopped a fried egg over the mix, pinched it with salt, and called it good. Delicious. eating this for dinner as i type. uh, yeah, so this is totally awesome. am going to eat the whole thing. sorry boyfriend. Reminds me of egg and asparagus pizza in Italia. Egg hub with asparagus spokes radiating out, simply delicious, thanks! Fantastic! I brought to a brunch party and got rave reviews! Thanks for posting. The crust is fantastic too. Will definitely make again. I made the breakfast pizza this morning. It was yummy, but the way I prepared it, it ended up a little too dry. I’m not sure if I added too much flour to the peel or if it was because the crust just ended up too thick.. but I ended up experimenting with some creamy havarti cheese on top, popping it in the microwave for about 30 seconds, and it took all my memories of dryness away:) Nom nom nom! 500 degrees burned my pizza to a crisp. It looked like all was well after the rotating, but three minutes later it was completely black. Frowny face. This is great! I can’t wait to try the recipe. My husband is going to absolutely love it, thanks again! If you haven’t had pizza for breakfast you haven’t truly had a few too many drinks the night before. Cant wait to try this recipe. Chose it because I’ve never seen anyone serve pizza at brunch. It was a hit among a group of brunch aficionados. I did take one shortcut and bought pizza dough from trader joes. I made whole wheat pizza tonight and have leftover dough, so I’ll be making this in the morning with onions and spinach. No bacon though, but I think it will be good without it! Thanks for sharing! I like your blog. Provided with detailed recipe. I will surely try this at home. This will be a whole new dish to my list. Thank you for the post! Wow! This is a perfect pizza for breakfast! I love how the egg is shiny on the top, so tempting! I make something similar with red bell peppers and sesame, and yours will be a great cahnge for us. Thanks for the idea! These look awesome! Have you tried making it like a calzone? Not sure if the eggs and everything would cook the same. this looks delicious! can’t wait to try it out this weekend. This is great! I’d like to make a vegetarian version….what could I substitute for the bacon other than mushrooms? What temp should the pizza be baked at? The recipe says 500, but you can use your oven’s highest temperature, whether it is higher or lower. Thanks Deb! The pizza turned out wonderfully. Love your blog! Delicious recipe~everyone enjoyed it a lot!! I have used this recipe twice for weekends with guests and it is a huge crowd-pleaser! Everyone is impressed, and I have passed on the recipe to at a dozen others. Thank you, thank you! waaaw! sounds so delicious! can’t wait to make it and eat it! mmm…. WOW! My 2 favorite meals in one! Pizza for breakfast, sure, but usually as leftovers. Now its leftovers for dinner. Looks great, Thanks! Made this yesterday for Easter brunch, and everybody LOVED it. I didn’t even get a slice! It received rave reviews from my family. I turned the oven temp to 425 after the first one because it burned quickly at 500. I’ve been making this pizza for a while and just covered it on my blog. Thanks so much for the inspiration all around! PIZZA! you make my tummy ache. I am so craving for you. Really really have to try this out later. It’s gotten eggs on it which is looks more yummy. Thank for this delicious write up. Can’t wait to try it out. Just in case you read comments on old threads—Ree’s tasty kitchen post is a similar looking pizza, except done on a grill. What do you think? Sure, grilled pizza is awesome. Yum! This is quickly becoming our favorite breakfast-for-dinner option. I didn’t have parmesan this time but subbed dollops of goat cheese and it was delicious. Thanks Deb! Ever since I have seen this recipe I have been absolutely mesmerised by it. It’s so innovative – who’d have thought you can get all the essential components of a full, cooked breakfast onto such a non-fuss pizza? I am making it for the first time tmoro – wish me luck! it probably won’t be as wonderful as yours, but boy – what stunning pictures you have taken! Thank you for such a beautiful site, beautiful recipes. You really put the fun back into cooking! I have been cooking for many years, in fact I had a catering business that specialized in serving breakfast in business settings. Needless to say, I have tried a lot of breakfast pizzas, but this one is truly unique. Typically, the eggs are not cooked whole like you show in this recipe, that in itself is very interesting. I am really looking forward to trying this recipe, although I think I might include a little more seasoning – that’s just my personal preference. Great site! That looks delicious. I’m going to try that this weekend. Ahh this recipe is great! Mixed it up a little by adding spinach and chopped onion but it was still wonderful. Can’t wait to make it again, thanks so much for sharing! I just made this! It was great. I was a little worried about the eggs ( I don’t like them too runny) but this was perfect. Thank you for sharing! looks yummy! the crust alone is gorgeous. Yumminess! This looks absolutely wonderful. Thank you so much for this idea! I made this yesterday for a bridal shower brunch and followed your instructions in the headnote for mini do-it-yourself pizzas. I tripled the dough recipe (there were 15 guests). I put out mozzarella, cheddar, swiss, green onions, bacon, ham, spinach, mushrooms, and red peppers. And, of course, eggs! I would have included goat cheese but there were three pregnant guests and apparently goat cheese is Looked Down Upon for pregnant women, so I just avoided the controversy altogether. It was a really great activity for a crowd and it was interesting to see what people selected for their toppings. To my surprise, a few people disliked any eggs that were not scrambled and just made a “regular” pizza, which they also enjoyed. I served this with your winter fruit salad and the pairing was delightful. Thank you so much for your consistently awesome recipes. I look forward to your cookbook! What a phenomenal idea to make a breakfast pizza. I just love breakfast. The picture is so beautiful. Can’t wait to try this. I was wanting a good lite recipe for breakfast pizza!! We made this for dinner tonight! Great recipe!! It is easy to make. With a puppy, 1yr old, and 4yr old it does get crazy around here. This is a easy quick meal to make!! Very filling, and great for the whole family!! We enjoyed it more than the traditional sausage, egg, and hashbrowns. Thanks for sharing this!!! mmm i love eggs- this looks sooo good! There’s this awesome tiny little pizza place in San Francisco – Pizetta 211 – that does farm egg pizzas. They are absolutely heavenly! So i’ve tried a few times at home to recreate some modicum of the yumminess but I’ve never been able to get the eggs done just right They always came out too raw whle the pizza was done or too rubbery. Thanks for the recipe- i had been just “winging” it – maybe this will turn out better than my unguided attempts! I used my own toppings..the only thing that was just like this pizza was the fact that I used fried eggs on top. I had to make the crust gluten free, so the cooking times were different and temperature, and the egg yolks didn’t stay in tact. But it looks very yummy in the picture! This is officially my FAVORITE food website/blog!!! Got the ingredients to make this last nigh; will be making this first thing Saturday morning and I am sure it will be a welcomed change from the routine…will let you know how it goes! I made a personal size version of this pizza this morning. I had some avocado and black beans to use up, so I made mine Cali-Southwest style. It was delicious. I love your site!! I always get such great ideas. Never would have thought to make a pizza with breakfast on it. What a brilliant idea! Can hardly wait to give this a go! So yummy…we had none left over … I will make it again. Made individual pizzas on the BBQ for a tail gate and they came out great. Cooked the eggs untill the whites were firm, but the yolks runny…this was the best part — runny yolks over gooey cheese and crunchy pancetta (ooh I substituted this for bacon). Also too make things go smoother at the tail gait I had everything already chopped and prepped and the pancetta already baked to a crisp. I placed my pizza stone on the BBQ and covered it for the cooking. No problems. Hi Jennifer — Comments don’t have to be boring; quite often there are wonderful discussions of recipes and how they’ve been adapted, and new ways they can be used. Leaving comments that just insult other commenters (calling them bored), however, definitely diminishes the quality of conversation. By what magic were you able to slide the pizza off the peel into the oven without the egg rolling off? I made personal-sized ones, and every time the egg totally skooched off ahead of the rest of the pizza, right onto the pizza stone. Must be “all in the wrist.” Ended up turning them into calzones, still delicious! This looks like such a creative hangover food..must try. Lovely idea for having pizza in breakfast. Simply waoooow! Especially i like eggs topping over it. The picture of it looks great. I really really like the recipie. Definetly i will try it for sure. This made our morning today! It just got on the short list for the weekend breakfast rotation and a must make for upcoming house guests. I threw in a teaspoon of vital wheat gluten that i had on hand with all purpose flour to attempt that bread flour chewiness and it helped. The green onions are a must, as is a healthy dotting of Sriracha at the table. Thanks for the delicious wake up! This is what I love, breakfast pizza is truly inspiration. I wonder if I can use wheat dough. Made this tonight for brinner! Unique and tasty! I made this for breakfast and added sliced rosemary and olive oil roasted potatoes to it – superb! This was great! Next time I’ll have to adjust the cook time/temp because my cheese got kinda burnt but it was still delicious, eggs on pizza is amazing. This recipe looks amazing. My favorite breakfast egg dish is eggs in purgatory (eggs cooked in any form of your favorite tomato sauce) and I’m sure ill be making it in the form of this pizza within a week. Quick Question: I don’t have a pizza stone. Is there a substitute method or kitchen tool I can use to achieve the same effect? Hi Sarah — Yes, I offer some tips here. Found it at Pintarest. Just tried it. My goodness this is very, very good. Is there any problem if I translate your recipe into Spanish and post it in my blog? Of course, I shall indicate where the recipe is from. Please let me know. But meanwhile, I think I will have another breakfast pizza in 2 more days! Terry — The details/rules of how to do this are over here. I made this last night as a comparison to the breakfast pizza from the Grotto in NYC. I have to say that the SK version wins out big time :) Made this using your “Leisurely Pizza Dough” from your book but otherwise followed the recipe and enjoyed every bite. I made this tonight using the raw dough from Trader Joe’s since I didn’t have time to throw together homemade dough. Also added an extra egg so each family member could have an egg of their own. Since I don’t have a stone, I got a pizza screen, which is basically a large round piece of metal mesh for baking pizzas on and just assembled and baked it on that. You can find them in most commercial cooking stores (not Bed Bath & Beyond, but one where they sell restaurant supplies). While it’s not QUITE as good as cooking on a stone, it’s the best alternative I’ve found thus far. My family officially declared this pizza phenomenal and it will be part of our official rotation from now on! I think it reminded my husband of the pizzas he had in France, where they also crack whole eggs onto them before baking. Simply wonderful. Suggestion: Add the eggs about five minutes before taking the whole pie out of the oven. That way they’re all yolk-ey and delicious. Also, some hashbrowns tossed on there would be AWESOME. Hi Deb- I’m thinking of serving this for bunch, do you have suggestions of what else to serve with it? Everything I think of is already in the pie… Eggs, check; a carb, check; meat, check. What else can I put on the table without being redundant? do you have to use mozzarella? LOVED the pizza. . .I always end up in the kitchen rather than enjoying my guests so I did everything but the eggs and put it back in the refrigerator. . .took it out cracked the eggs and away we went — so my lovely patio, some fruit salad, prosecco and orange juice. . .and a fabulous breakfast pizza! Next time I will add some sauteed mushrooms and spinach I think. . .great recipe — thank you! Awesome pizza! This crust is to die for. Best homeade pizza crust I have ever made! The only suggestion I would make is to crack the eggs once the pizza is in the pizza stone. When you slide th pizza onto the stone the eggs tend to slide around. Other than that, great recipe and good instructions! Pizza for breakfast is one of my favorite things, but it’s hard to beat left over Round Table King Arthur Supreme cold hard, fresh out of the refrigerator. My son also loves to eat pizza and every Sunday I cooked for him. The past Sunday I read your blog and uses the ingredients which are suggested by you, sir. These ingredients are so good and give a unique taste to the pizza. My son really likes it and he was very happy this is only because of your recipe of lazy pizza dough.